I sleep in Katie’s bed far more often than I should. Yes, she’s snuggly and yes, I may be trying to soak up every single moment of my time with her. But those aren’t the biggest reasons. Why do I prefer to sleep in her bed? Several months ago, Craig and I went out and forked over an insane amount of money for a new mattress. Once we got it home, neither of us loved it nearly as much as we hoped, but you know, when you’ve had to sell a kidney to buy a bed, you kind of want to keep the rest of your organs, so you just deal with it. No sooner had I accepted that perhaps sleeping on a cloud wasn’t realistic, the lovely people over at Sleep Number® contacted me and offered me a … wait for it … brand new Sleep Number® m7 Memory Foam bed. So, I did what any smart mother would do and asked if they’d be willing to send it for Katie instead. We had begun researching mattresses for her as she was ready to move out of her toddler bed, so it seemed the perfect solution. 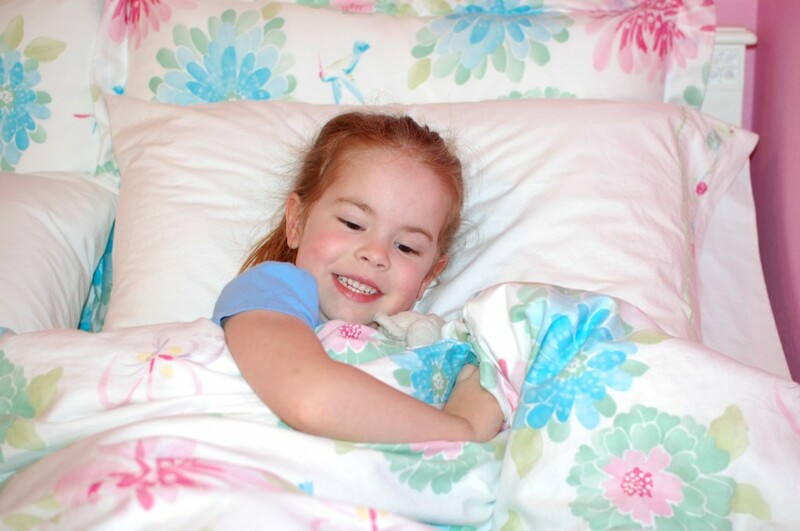 One thing that I learned when researching mattresses for children is that our sleep needs change over time, so the firmer surface that’s comfortable for a child of five will be far less comfortable by the time she’s fifteen. I was hesitant to spend much money on a mattress that we would likely have to replace in ten years. With the Sleep Number® bed, she’ll just adjust her settings as she gets older, ensuring that we’ll never have to buy her another mattress. So, why do I love her bed so much for myself? With 3-inches of CoolFit™ foam with gel technology it’s way cooler than my bed and I don’t wake up sweaty. The firmness of the m7 bed is totally adjustable, so I’m able to set her number to the perfect level of comfort. The memory foam is much softer and more breathable than in our bed. My restless legs that keep me up most nights in our bed don’t bother me at all in her Sleep Number® bed. I’ve struggled with this for so long and never been able to find relief, so this is huge. I wish we had visited a Sleep Number® store when we were shopping for our mattress. As we laid there on the beds, we had no idea what the mattress would feel like over time. If we had bought a Sleep Number bed, we would have had the ability to adjust the bed to make it perfectly comfortable. And the Sleep Number® DualAir™ technology would have allowed us to set our numbers to adjust the firmness on each side of the mattress so we could have both been completely comfortable. So, until we finally admit defeat and give in and buy an m7 for ourselves, if you need me, you’ll probably find me in Katie’s bed. You can find Sleep Number® on Facebook. And I dare you to watch this video and not want one! I received a free Sleep Number® m7 Memory Foam bed to review from Select Comfort / Sleep Number for this post. Wait? It seriously helps with your restless legs? I am going to pretend I didn't hear that, because we are absolutely NOT in the market. Angela…I swear! NO restless legs in her bed. But in mine, I have them most nights. I love love love my sleep number bed. I've had mine for (I think) 10 years now and wouldn't change it for the world!! How can I get a new bed for myself? This one sounds heavenly!!! I thought you were going to say that the new bed that you dislike is a sleep number…because we shelled out big bucks for one and we hate it! Biggest complaint: I like a much lower number than my husband. As a result, the bed is lopsided, and he constantly rolls "down" the bed to my side. He was not a bed hog prior to getting this bed. As a result, I sleep poorly because I'm bracing myself on the edge of the bed. Or, I can set my number to be the same as his so the bed is flat. But this is also rediculously uncomfortable, and I wake up with pressure points in my hips and shoulders. My advice: only buy a sleep number bed if you and your "other" like the same number setting. my confession: our mattress is one an ex boyfriend's parents gave me that they weren't using anymore. But we have NO money for a new mattress. I would love to try a Sleep Number bed. Katie is one lucky girl! I secretly am trying to trash our mattress that we've had for eternity so that I can get a new one. I let my kid jump on it and my dog sleep on it. Katie, I think I just fell in love with you for that comment!!! Also, I will compete with your oh-ma-gaw mattress story b/c our mattress is some insanely expensive, handmade one from Sweden. My parents bought it for themselves, used it for a few months and then bought a new bedroom set and the mattress was too small. So they gave it to us. So, yes, we're sleeping on my parents' used-for-several-months mattress. And I don't care b/c I'd never spend that much on a mattress, even though it's totally worth it. We use to have a sleep number for a long time and loved it….until our dog peed on our bed and we didn't discover that it leeked through and developed mold in the foam underneath!!!!! Yes I know disgusting. But as soon as we got rid of it my poor husbands allergies went away in our room! So needless to say we didn't want to buy a new sleep number because of the cost. Boy do we regret it! Got a new bed and it's terrible! I can't wait until I can save up for a new one! Katie you are one lucky girl and Nichole you just keep snuggling for as long as she will let you! We have a Sleep Number bed and I LOVE it. Todd, not so much. Maybe he just hasn't figured out his number yet. I'm a 55.